It would indeed be nice to have a home set in a place where the family love and where different activities are done by the family members. 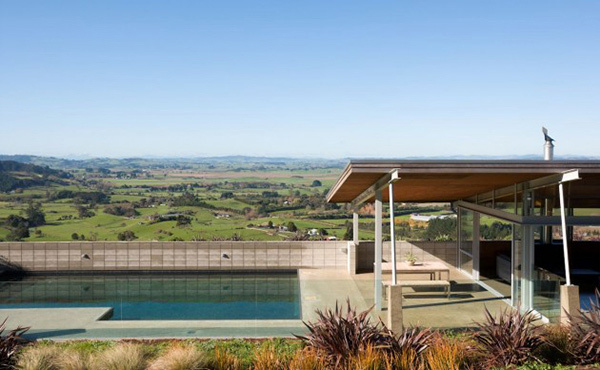 Our house feature for today is a large country house located on the slopes south of the Bombay Hills in Auckland, New Zealand. It is made for a family of five with strong family ties to the local farming community. With that, the house is built on a location where they can still be connected to the world that they love. 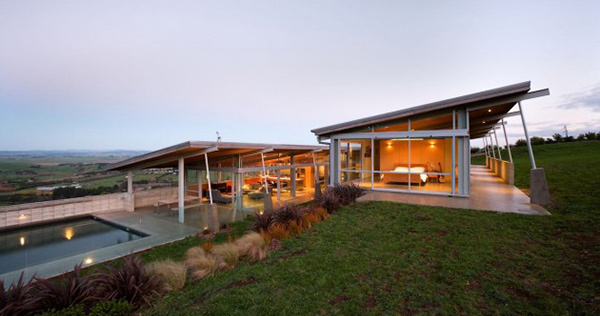 The low-slung form of the house is designed based on the natural land contour and is anchoring into the slope to protect it against strong south-westerly wind. In the north, there is a sheltered courtyards and verandahs. 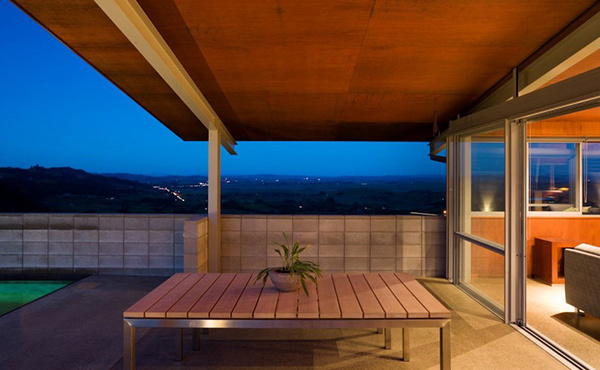 The Foothills house is comprised of three zones, the interior, interior courtyard and outside courtyard. The interior courtyard uses irrigated planting to “condition” the internal air supply. There are large overhanging eaves to control solar gain in summer months while the roof is angled to allow maximum penetration of winter sun to exposed insulated concrete slab (mass) providing passive solar heating, and minimal reliance upon artificial heating sources. Before we reveal other green facts about the house, take a look at the images of below so you can better understand how the house works. This is indeed a lovely sight! 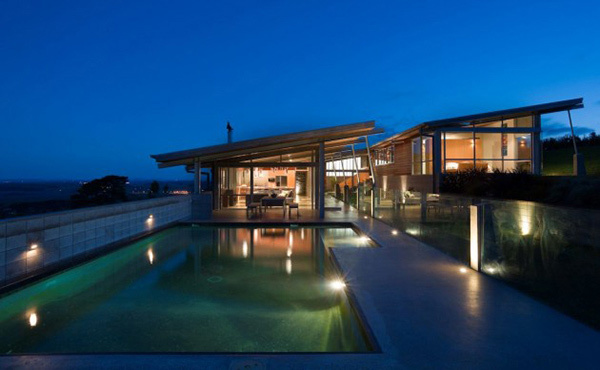 With the lights on, the house looks like a gem on a high point of the hill. Even during daytime, the house is a wonder! 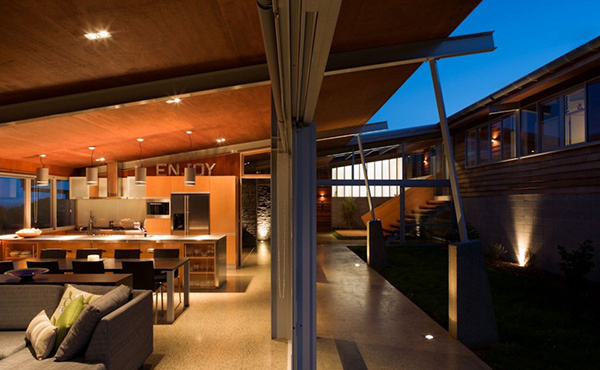 It might look simple and raw but when you look into the features of the house, you will surely be left in awe. From the house, you can get a good view of green vegetation. Notice how it used natural landscaping around it just like what you see in the pool area. Near the pool is this dining area with benches and a long rectangular table. A closer look at the table which has stainless frame and wooden planks on top of it. What you see here is the living area and the kitchen of the house. You can also get a glimpse of the other house that is elevated leading to the private areas. 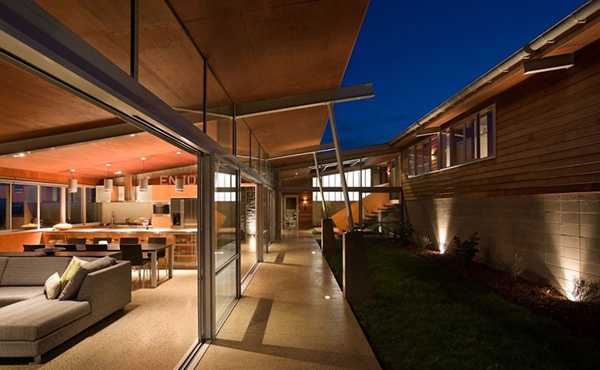 With glass all around this, it opens to the interior courtyard in between the two volumes of the house. 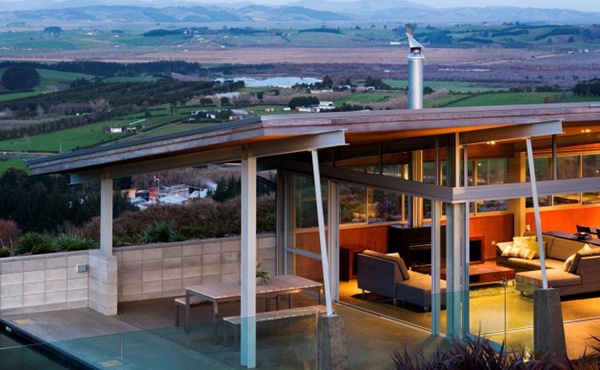 The roof has deep eaves and is designed in a manner that it can protect the house from strong winds. 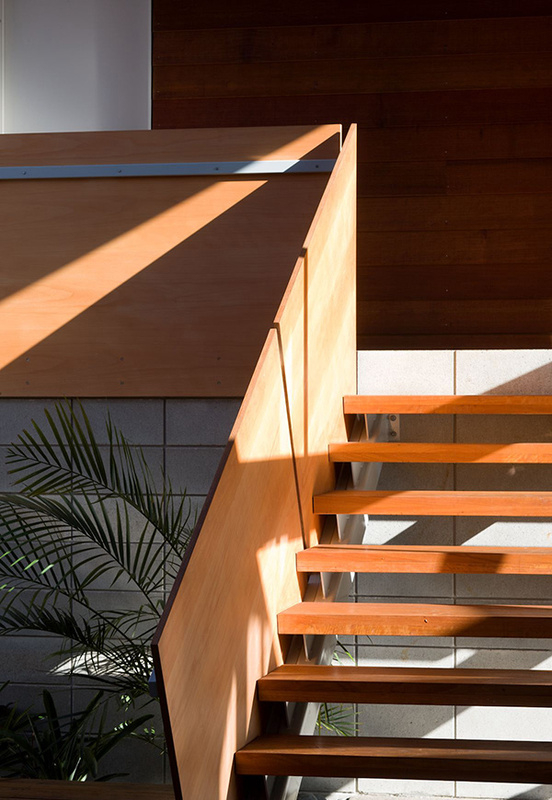 Wood is one material that is used all throughout the house just like this wooden stairs. The floor plan of the house is seen here showing the different functions and spaces. 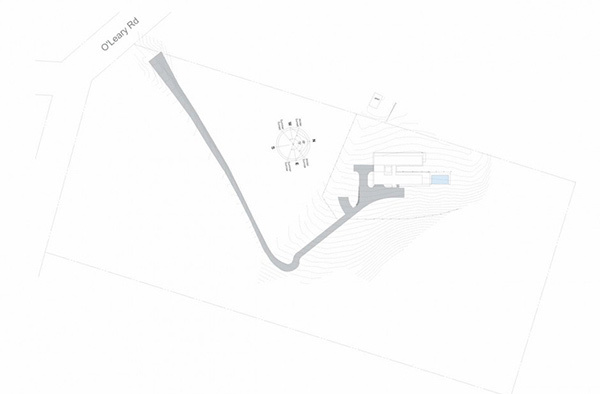 Sketch plan of the house on how it looks when viewed above. 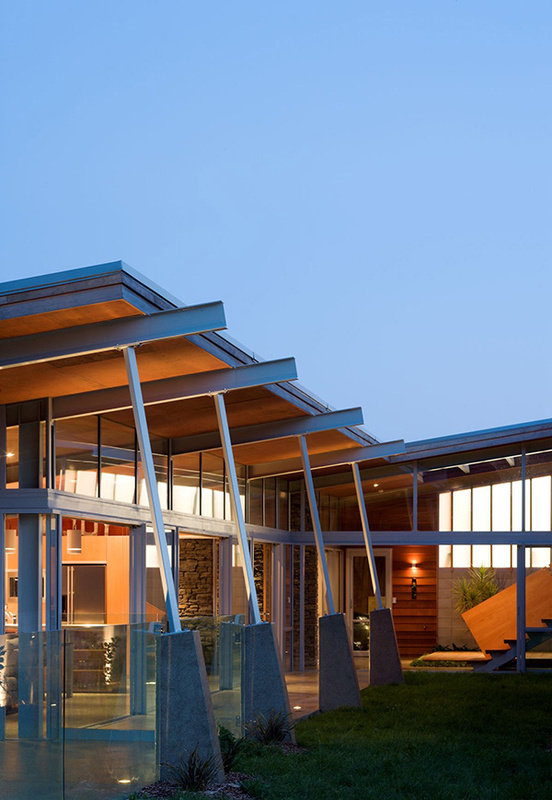 The Strachan Group Architects added other green features to the house like: overhead double glazing, and use of thermal drapes to minimize heat-loss; on site rainwater collection, storage and treatment for potable drinking water and extensive garden irrigation 75,000 liters, orientation of plan coupled with reduced glazing to south façade to minimize heat-loss, glazed louvers over internal doors to provide cross ventilation and natural cooling in summer months; low slung roof allows cold south/southwest winds to flow over the building envelope. Roof pitch follows natural slope of land and stepped floor levels minimize site excavation/cut and fill; double burning wood-burner for back-up winter heating using firewood sourced from site; composting on site of household vegetable waste; and full on-site effluent disposal system for irrigation of native screen planting/wind breaks. With all these green features of the house, who would not love to live in it?